NEW DESIGN COMING SOON – PLEASE ASK FOR DETAILS!! 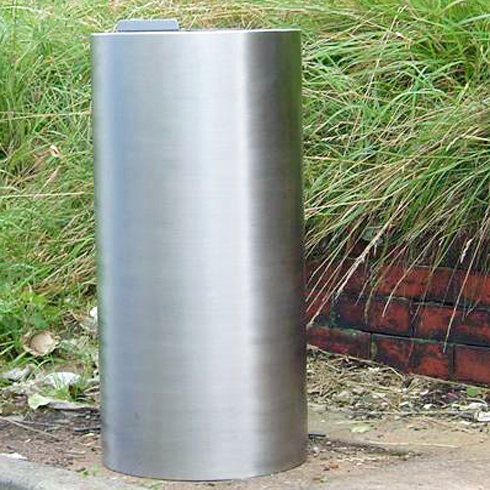 Vandal Resistant: It is more difficult to vandalise stainless steel, and it can be chemically treated to remove graffiti or re-buffed to remove any etching. Fire Resistant: Because the natural resting position of the lid is where the aperture is closed, the oxygen supply is restricted making it much harder to start a fire in the bin. new lid design, the amount of firework types that can be inserted into the bin has been reduced. Cost Effective: It has been estimated that the new bins may last up to 20 times longer than the bins made from mild steel. Maintenance: The company commissioned to make the bins, offer maintenance contracts that ensure the bins are checked for safety, are cleaned and sterilised internally and any graffiti removed. The bin is emptied from above, reducing the risk of injury to the person emptying the bin. The SharpShute®™ employs an internal mechanism that helps ensure deposits fall easily into the internal removable needle bin. Congestion Resistant: The internal system has been designed to greatly reduce the chance of anything blocking or congesting the bin lid. Theft Resistant: Unlike the fist bins which where fixed to the ground or wall from the outside, the SharpShute™ was developed so it was fixed from the inside. This reduces the possibility of the bin being moved or stolen. The design of the lid (which has registered design and patent pending) was designed especially to reduce the risk of anybody being able to get inside. Blackpool Council requested that the new design should be able to be shut down. The SharpShute can be provided with a special blanking lid, which enables the bin to be closed for any reason. As the SharpShute has been made to be free standing and is less likely to facilitate fire, the SharpShute should provide fewer problems to insurance companies. Accepts Single Needles and Sharps Boxes: As can be seen from the picture below, the SharpShute has been developed to accept single needles and sharps boxes. The lid can be altered to accept a variety of different types that are commonly used by needle exchanges. As the lids can be altered at any point and replaced, it is easy to change and update the SharpShute to different demands for the future. Water Resistant: The SharpShute has been made in such a way that the chance of water getting in the bin is greatly reduced. New Keyless System (patent pending): To ensure the locks cannot be damaged or glued, a new keyless system has been developed. Looking at the new SharpShute, nobody would know how to gain access. 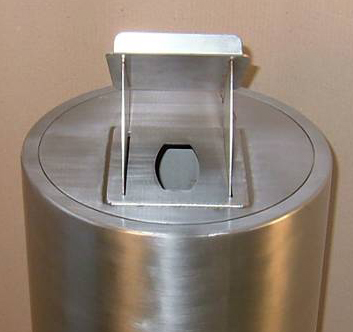 Stainless steel needle disposal bins. Fantastic quality and ideal for County Councils or similar environmental clean-up situations. SharpShute from Barrington International provides a robust and unique solution to the disposal and secure collection of drug related litter including discarded needles.